HVAC WordPress landing page theme is a new clean and professional solution and also perfect for those businesses that offering a heater and air conditioner repair, replacement, and installation services. It can also serve as an air conditioner and air supplies store that make a good website for home maintenance and cooling/heating ventilation services website. HVAC WordPress Landing Page Theme is a highly professionally-made and good-looking landing page theme for modern business and firm environment. This HVAC WordPress landing page theme includes the homepage consists of a full-width banner image with text blocks and other important sections like Call Now. You will have a chance to showcase your featured work, Partners, featured services, price & packages, gallery, and share the stories of your success on the blog section. 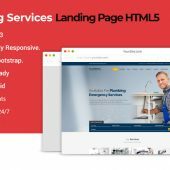 With HVAC WordPress Landing Page Theme anybody can easily create its own professional landing page for successful business without writing a single line code. All elements are completely editable, you can change colors in few clicks, texts or replace the images. This Theme includes everything you need to take your company to the next level, but most of all, it’s extremely easy to set up and use. 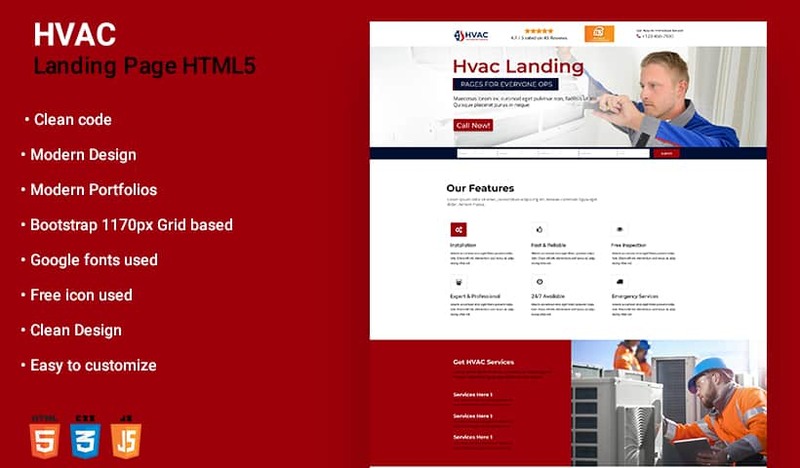 This HVAC WordPress landing page theme is markup validation service is a validator by the World Wide Web Consortium (W3C) that allows Internet users to check HTML and XHTML documents for well-formed markup. Air conditioner & HVAC Repair WordPress landing page Theme is most suitable for business specializes in AC repair and electrical services, Air conditioner installation, appliance repair, construction and machine technology, duct cleaning, gas refilling, handyman, heat pump and Furnace, heating and cooling, HVAC repair store, inverter ac air con, maintenance and renovation, piping and trane repair, refrigeration and air conditioning, water leakage and air supply. This heating and cooling WordPress theme is completely tested on multiple browsers like Safari, Chrome, Firefox, Internet Explorer. While cross-browser means a website works in any browser, and any version of the browser, being used. This can be a struggle for developers throughout the creation of this HVAC webpage. Font Awesome gives you scalable vector icons that can instantly be customized for example size, color, drop shadow, and anything that can be done with the power of CSS. This HVAC theme is fully integrated with font awesome feature. Google font allows you to choose from over 600+ Google fonts and font variants to insert into your website without coding. This HVAC WordPress landing page theme integrated with world`s best plugin Yoast SEO. Yoast SEO does everything in its power to please both visitors and search engine spiders. This heating and Cooling Theme Provides complete Documentation. You can easily use theme features like create a page, post, king composer Short-Code, Theme Option, Widgets etc. Just follow our steps and enjoy our best theme. Thank you very much for your quick response and achievement, you saved us days of work and frustration. We will use you once more! Very good design customizable themes, one of the best WordPress themes in the market! I used this theme for my client, we have done $100 but when he saw his website he gave me $120. Highly recommended for any kind of website. I love this WP theme because a customer asks me for a website. I waist a lot of time but when I found this theme that looks the best for the industry. Thank you; keep up the great work and demo’s coming. WOW! After Using this theme won’t find any other theme. Your theme is very beautiful and fully supported. I just wanted to thank you for your awesome theme. Fantastic Customer Support and Awesome Design.